Americans concerned with the Irish conflict and its aftermath met in San Francisco and New York in recent days after the leadership of Sinn Féin, including Gerry Adams and Martin McGuinness, invited discussion on Ireland’s re-unification and how Americans might best help to bring it about. Many believe that issue had been resolved with the Belfast Agreement of 1998 and they would be correct to a point. To this day, most Americans are unaware that in 1918 the Irish people as a whole rejected British rule in a general election in which nationalist candidates, most in British jails, received nearly 80 percent of the vote. The British unilateral partition of Ireland two years later prompted not only a civil war but decades of armed and constitutional struggles to restore that sovereignty denied the Irish people. Unfortunately, that struggle effectively ended with that accord. There was to be no do-over of the democratic vote of 1918 that parliament rejected. Instead there was a “partitioned plebiscite” on the Treaty itself with its oblique references to Ireland’s re-unification. As much as it pains me to say so, Ireland’s unity remains as firmly in the hands of a British parliament today as it did in 1918. So as far as putting Ireland’s national self-determination on the American foreign policy agenda, that train has left the station. The good news is that the agreement did end London’s corrupt version of democracy and the murderous rampages of her majesty’s terrorists, uniformed and otherwise. The decades of sacrifice by the brave nationalist community and the resistance of men and women in arms had at last born fruit. While the Good Friday Agreement is now the major factor limiting any American role in ending partition, there are other impediments. There is firstly the matter of scale. Tiny Ireland barely shows up on the foreign affairs radar screen of our Department of State, long under British dictation. Only the huge Irish-American presence in the electorate counter-balances this. There has also been the issue of Americans’ interest in democracy and justice in the North far exceeding that of the Irish government of the day. It is worth noting that the Irish government is not hosting these forums or, for that matter, ever hosted any discussion in America about national self-determination and unity. Finally, there is the small matter of pervasive British influence in two areas important to the conduct of foreign affairs: academia and the media. These fields of play have long been ignored by activists. As a consequence, what influential Americans read or hear about Ireland and the conflict is often fed to them by British sycophants. On campuses across the nation, apostles of the mythical “special relationship,” particularly those enthralled with all things royal and imperial, teach unchallenged the English version of Irish history. It is, therefore, a daunting task to heed the call of Sinn Féin and face those obstacles. However, the problems don’t end there. There is the real prospect of repeating the mistakes of activists over the past 30 years. Take for example these forums. Foreign policy is shaped with strategic and tactical objectives defined at high levels of government and commerce over extended periods of time. The open-mike discussion of Ireland’s unity without the Irish government is, in truth, little more than a Sinn Féin pep rally. In the past, capable and informed advocates have been in short supply. A meeting was once arranged to discuss the Irish conflict with Congressman Hamilton Fish, then a key member of the House Judiciary Committee. Instead of making key points and seeking action, Fish was lectured on the scurrilous deeds of the English pope, Adrian IV. Advocacy by Americans has often lacked two necessities for success: consensus and focus. Lobbying objectives often shifted with each new escaped Irish prisoner who made it to these shores. Priorities and fund raising changed so often I was convinced it was a British ploy to minimize our impact. Lastly, for too long, lobbying efforts were focused on east and west coast friends in Congress with little consideration given to where power in foreign affairs really rested. The Irish-American presidential forums under the leadership of New York legislators like John Dearie and Joe Crowley restored the focus on presidential action. Richard Haass, the president of the Council on Foreign Relations, recently wrote that success in Iraq, Afghanistan and elsewhere has for too long been defined in terms of improbable outcomes e.g. free democratic elections, rule of law etc. An action agenda for Americans which focuses on a re-united Ireland is a non-starter because it has an improbable outcome. Americans, however, can be of tremendous assistance. Prime Minister Haughey, in New York, once claimed that our support lifted the voice of the Irish government in its dealings with England. Let me suggest the areas where U.S. support might be most welcome and productive. 1. Media monitoring. If journalist Bernard-Henri Levy in the Wall Street Journal could criticize the Kremlin for “..shameless twisting of law and principle” what then might we demand our president say about Britain’s corruption of law in justice in the North? 2. Democracy. No matter what phony democracy is instituted in the six counties, orders from the Privy Council in London can overrule everything including lawful human rights judgments. The U.S. should demand an end to this veto power, a vestige of the colonial era. 3. Truth. The U.S. has recently demanded from China the truth and accountability for Tian-an-Men Square. If the challenge by Secretary of State Clinton is not just for show and we are making these demands of a country that virtually owns America, how much more forceful should we be in demanding the truth and facts of over unsolved killings (mostly of Catholics) by the so-called forces of law and order in Northern Ireland. One can only imagine what Britain should pay for the last 100 years alone of murderous mayhem and anti-Catholic oppression that has wounded generations of Irish families. Why shouldn’t Americans lead the way in support of such compensation for Ireland? 5. Justice. The Belfast Agreement has failed to provide justice to the victims of the Bloody Sunday massacre, the Dublin/Monaghan bombings and the families of solicitors Rosemary Nelson and Patrick Finucane. Every day the U.S. protests action by foreign countries, imposes sanctions and/or restricts aid to discourage human rights violations, or to uncover unpleasant truths. Why should Britain get a free pass? Americans must show the world England’s real legacy in Ireland. 6. Education. To the extent Americans know anything about Ireland’s history and culture it is the sanitized English version. Conversely, England’s undemocratic occupation of the North, the treachery of its “security forces” and their corruption of law and justice there is rarely found in text books, documentaries, scholarly journals or academic study. Americans should change this and promote a more balanced view of history than that of the oppressor and the conqueror. Sinn Féin knows full well that Whitehall has plans for the next 50 years in Ireland and is correct to be solicitous of Americans to disrupt those plans. But they signed the means and mechanism for Irish unity in the Belfast Agreement. Asking Americans to push public officials here for that is doomed to failure will only harm the credibility of other equally desirable areas of advocacy. 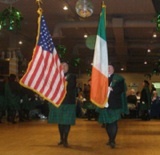 * Michael J. Cummings serves on the national boards of the Ancient Order of Hibernians, the Irish Northern Aid Committee and the Irish American Unity Conference.